Tessa Hadlock was confident that her worldly 13-year-old child could fly alone to Spain and back. Unfortunately, she was only half right. On the way home from Barcelona the airline denied her son boarding. It turns out he wasn’t quite old enough to fly alone after all. This unaccompanied minor fiasco ended up costing Hadlock an additional $1,803 and hours of worry. And now she wants a simple question answered: How was her son old enough to fly alone to Madrid, but not old enough to fly home from Barcelona? Oh, and she would also like her $1,803 back. Hadlock’s tale is a cautionary one for all parents currently planning summer air travel for their kids. Across the airline industry, there is no standardized age at which a child can fly alone. So it’s up to you to know and understand all the rules associated with all parts of your child’s itinerary. My child can fly alone, right? Last summer, Hadlock planned for her 13-year-old child to fly alone to Spain to visit family friends. In past summers, she had paid Iberia for its unaccompanied minor service for her son’s flights. But since Iberia allows children who have reached the age of 12 to fly alone without additional assistance from the airline, this year he was going solo. Hadlock booked her son’s ticket directly through Iberia’s website. Her newly minted teenager would fly from Boston to Madrid and then return from Barcelona — alone. However, the problem with this itinerary revealed itself on her son’s scheduled return date. That’s when he discovered that his mom had actually booked his ticket on two different airlines. And each had its own rules about the age at which a child can fly alone. Hadlock’s son was not old enough to fly alone on Level. In a panic, and thousands of miles away, Hadlock tried to figure out what to do. She called Iberia and a representative told her the airline could not overrule Level’s minimum age for a child to fly alone. Back at the airport in Barcelona, the family friends tried to switch Hadlock’s son to a flight on Iberia. Since the boy could fly alone on an Iberia aircraft, it seemed the only answer to the problem. Unfortunately, Iberia does not operate nonstop flights from Barcelona to Boston. And Iberia doesn’t permit children to fly alone on flights with international connections. 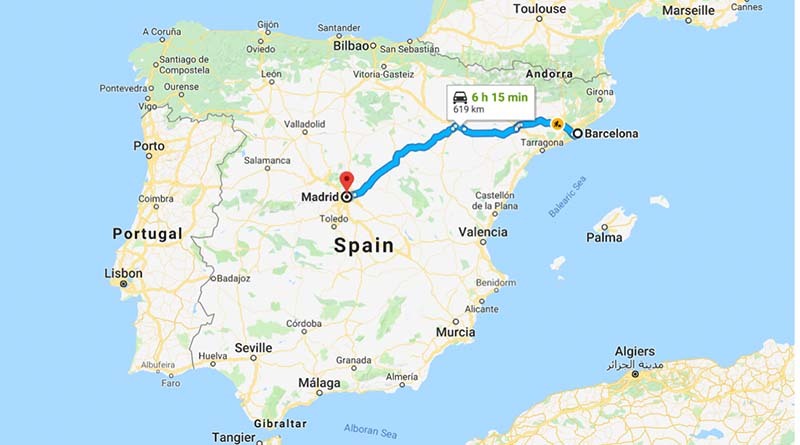 Scrambling for ideas, the family friends suggested that they could drive Hadlock’s son to Madrid. There, the child could take a nonstop flight home on Iberia. Faced with no better alternative, the group agreed on the new plan to get Hadlock’s son home. Hadlock’s friends purchased the new, much more expensive one-way ticket home from Madrid for the next day. Then they piled into their car and began the long, unexpected road trip to the capital of Spain. The group spent the night in Madrid. In the morning the teenager boarded his flight home — alone. Although Hadlock was relieved her son arrived safe and sound back in Boston, she was determined to get some answers. And, she hoped, her additional expenses back. Her request to Iberia asked for a variety of reimbursements for this unaccompanied minor disaster. By the time Hadlock contacted the Elliott Advocacy team, Iberia had already rejected all of her requests. Unfortunately, she had not followed the self-advocacy tips that our publisher Christopher Elliott offers in his article on the topic. When you’re trying to fix a problem with a company, it’s imperative to present a reasonable resolution. Hadlock’s suggested outcome included a refund of the original ticket and the new ticket, gas and hotel for her friends — not exactly reasonable. Especially since it remained to be seen where the mistake originated. We have looked into your case again and ascertained that the solution we gave was correct. It was time to dig a little deeper into this unusual case. Why did Iberia allow this ticket purchase from its website? Hadlock explained to me that her child flew alone to Spain one other time on Iberia since he turned 12. On that occasion, he flew round-trip to Madrid on an Iberia aircraft with no problem. When I made the new reservation on Iberia’s website, I made the rational consumer assumption that criteria for flying would be Iberia’s. I saw the words Level: Operated by Iberia on my son’s itinerary. But I had no idea it was another airline or that another airline’s rules would apply. And why would the website allow me to book an itinerary on which my child could not fly alone? Hadlock’s argument seemed logical to me. So I went to the Iberia website to see how this had happened. And that’s where the mostly bad news about this case came to light. And when I clicked on “More information,” additional critical details about Level and children flying alone were displayed. Level does not have any unaccompanied minor service. So no children under the age of 14 can fly on this airline without an adult. Hadlock was correct about one thing. From the moment she bought her son’s ticket, the return portion was invalid for his circumstance. And although Iberia had displayed the information above the booking page, she had missed it. Can Iberia Airlines provide clarity about this ticket? The case was a bit murky, so I decided to speak to our friends at Iberia Airlines. We have one of your customers here with an unusual problem. She purchased a round-trip flight on your website from the US to Spain for her 13-year-son. All went well on the way over to Madrid. But on the way back the boy was denied boarding by Level employees. 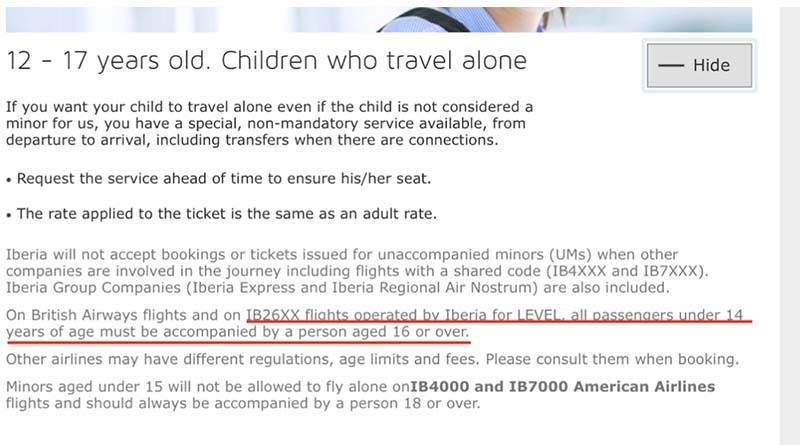 Iberia allows a child to fly alone at age 12, but Level requires children to be 14 to fly alone. This mom was forced to buy a new ticket for her son to get home. Since she purchased this ticket through Iberia and the entire ticket says that Iberia operates it, she had no reason to suspect there would be a problem. Minimally she is asking for a refund for the portion of the ticket that her son was not able to use. And soon I heard back from our executive contact. The Iberia team reviewed Hadlock’s tale. Our contact pointed out that all of the information that Hadlock needed to know is found on their Traveling with minors page on the Iberia website. My colleagues in the Customer Service department have reviewed Mrs. Hadlock’s complaint. We won’t be able to refund the hotel and transportation costs of her son as a result of he not being allowed on board on the LEVEL flight to Boston. On our website, we advised that children younger than 14 years old aren’t allowed to fly on their own when the flight is operated by LEVEL. However, in light of Hadlock’s confusion, Iberia agreed to provide a goodwill gesture refund of the Level ticket. Hadlock agrees that this is a fair outcome and wants her story told. She says she won’t make this mistake again. And she wants to warn other parents so they might avoid finding themselves in the same anxiety-provoking and expensive situation that she and her son landed in. Is your child flying alone this summer? If your child’s summer plans include flying somewhere alone, the Department of Transportation has created a helpful guide called When Kids Fly Alone. And for a quick reference here are the minimum ages for a child to fly alone without unaccompanied minor service in the U.S.